Unlike traditional colpotomy devices, ColpoWave's unique raised margins show you where to cut and where not to cut. As you rotate ColpoWave, tissue rises and falls like a 'Mexican Wave'. ColpoWave's unique raised margins show you precisely where to cut and where not to cut. ​​Rotate ColpoWave back and forth for clear visual landmarks and physical safety margins at all stages of the procedure. The raised edge lifts tissue at the vaginal vault and displaces the ureter: your SAFETY SIGNAL for where to perform coagulation and colpotomy. The raised 20mm margin shows you the ureteric entry into the bladder: your DANGER SIGNAL for where not to dissect, to avoid damaging the ureter. 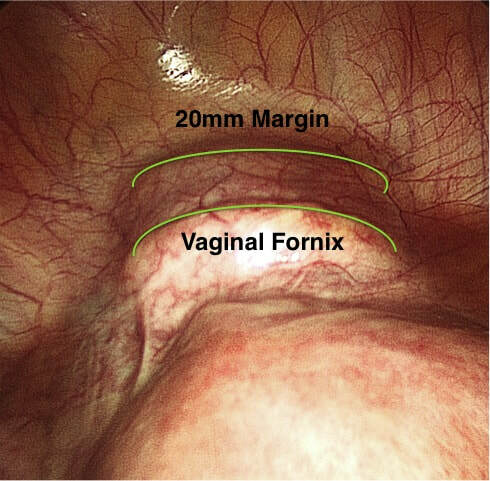 For ONCOLOGISTS, the 20mm margin indicates the clearance margin for radical hysterectomy.